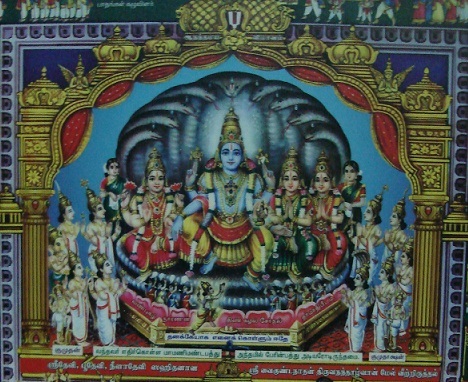 SrIman nArAyaNan who is enjoying unlimited bliss with nithya sUris and mukthAthmAs in SrIvaikuNtam (paramapadham), out of his causeless mercy, being worried about the state of bound souls who are suffering in this material world, descends himself in the form of many archA (deity) forms in many temples, mutts, homes, etc. 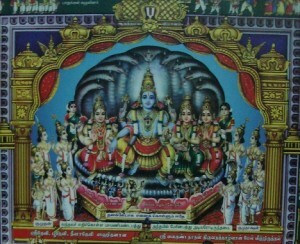 It is this archAvathAram (deity form) is the most merciful form and the epitome of bhagavAn’s most auspicious qualities. Among those places where emperumAn descends in archA forms, AzhwArs who were divinely blessed by emperumAn, perform mangaLAsAsanams to certain kshEthrams. These kshEthrams which are glorified by AzhwArs in their 4000 dhivya prabhandham are called dhivya dhEsams and are 108 in number. Of those 108 dhivya dhEsams, paramapadham is outside the material world – so it is unreachable in this life time for everyone and kshIrAbhdhi (milk ocean) is inside this material world, yet it is in a far away location. The other 106 dhivya dhEsams are very well within the bounds of bhAratha dhEsam and is spread in all the 4 directions. abhimAna sthalams are the kshEthrams which are held very dear by certain AchAryas who appear after the time of AzhwArs. 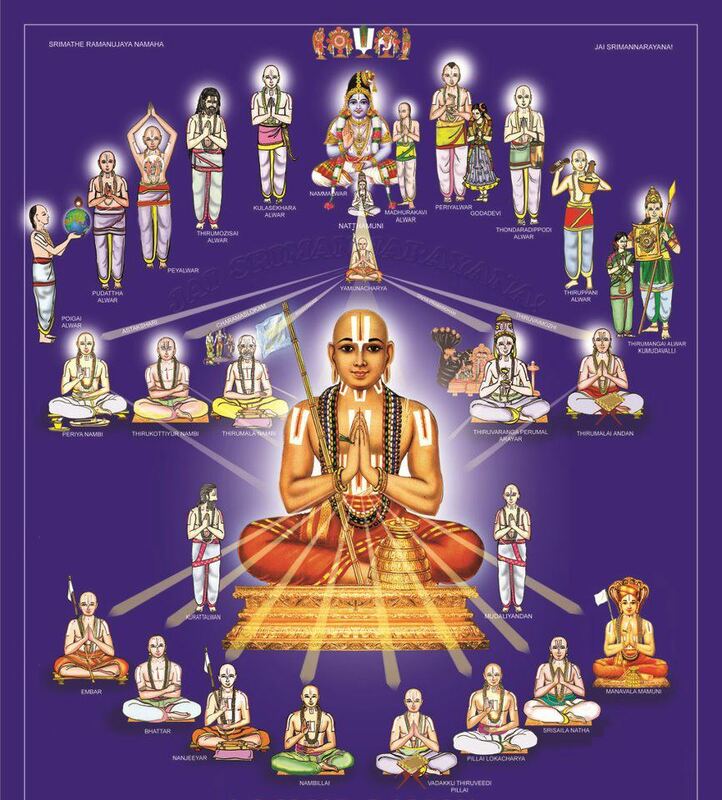 SrI rAmAnuja is glorified as the foremost Acharya of our SrIvaishNava sath sampradhAyam for his many contributions. 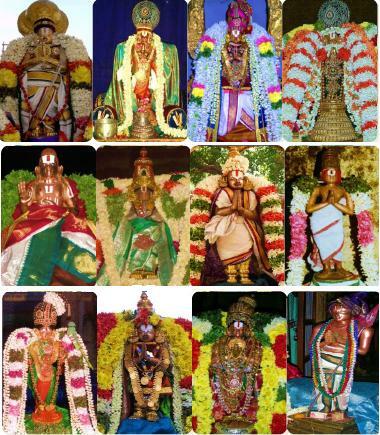 As maNavALa mAmunigaL identifies in upadhEsa rathina mAlai, “namperumAL declares that our sampradhAyam to be called as emperumAnAr dharsanam or SrI rAmAnuja dharSanam”. emperumAnAr‘s role in reforming the dhivya dhEsams is of immense importance for us. It is due to his most visionary steps, dhivya dhEsams and the temples in such dhivya dhEsams became the epicenter of knowledge, spirtuality, charity and collaboration (engaging in service together with other SrIvaishNavas) for the upliftment of entire population. This website attempts to provide a window to such dhivya dhEsams, abhimAna sthalams, AzhwAr/AchArya avathAra sthalams, their literary works etc. Please see full listing of dhivya dhEsams (in a single page) by clicking http://koyil.org/index.php/dhivya-dhesams/ with links to each dhivya dhEsam. This website portal is our tribute to our entire guru paramparai (lineage of spiritual teachers) for blessing us with such wonderful wealth of temples and literature which are solely focussed at our upliftment. namaskaaram. How do I get regular newsletters from your site? We dont have a formal newsletter in our website yet. We will add your email id in our mailing list and will send you regular updates. Adeyen Vanavamalai kasturi. From which source I can get audio of all the pasurams contained in Nityanusandanm book starting from thirupallandu, neetyattam Koil thiruvai,madal Ramanuja noortandadi kannin siruthambu poochoodal iliya satumurai ….ending with satumurai. எங்கள் குலதெய்வம் அழகர் கோவில் கள்ளழகர்/பரமஸ்வாமி. நாலாயிர திவ்ய பிரபந்தத்தில், எந்தெந்த பிரபந்தங்கள் திருமாலிருஞ்சோலை பற்றியது? Please see thiruvAimozhi 2.10 and 9.10. Also, in periya thirumozhi 9.8, 9.9 and in periyAzhwAr thirumozhi 4.2, 4.3, 5.3, 5.4. There are some more pAsurams too. Glad if my email is included in your mailing list and will be glad to receive regular updates. Adiyen, Srivaishnava dasan. Going through the prodigious amount of work that you have done by way of gathering so many resources in Tamil, English and Hindi and assembling them in one click is an astounding kainkaryam.My worshipful admiration at your feet. Kindly continue to expand the rich body of Srivaishnava litreature as appearing in several other Indian and foreign languages too so that your site becomes the final destination–Paramapadam for all book lovers and knowledge seekers in Srivaishnaism. Adiyen, in good time will share some little information on such resources(perhaps you might be knowing them!) on the Net. Kindly include this dasan in your list of followers. आप द्वारा कृपा पूर्वक प्रेषित e mail iam recived daily. If it is in hindi most of north india devotees followers are glas and know the information about our great saint. I view the articles every day as my Divya Prabandham and Desika Prabandham is in progress. It give me an opportunity to refresh the Pasurams learnt earlier. Swamin, Dasoham, In Bhagavadvishayam, there comes a mention of sarveswaran’s avataaram as kubjaamram. I could not connect it to any aithihyam. I would be grateful to you if any elaboration on this kubjaamram could be given. eventhough you saw me yesterday at pavitrotsavam, thirneermalai, i am unfortunate for not having a discussion with thyself. my d.in.law told today about meeting with thyself. let bhagavan grace me so that we can meet. please try in thiruvallikkeni, mylapore or kanchipuram.